Cameron's last day: Was this his most awkward gaffe? David Cameron will formally tender his resignation to the Queen today. Was this his most awkward gaffe when the PM forgot he supports Villa? The Prime Minister, David Cameron, has tweeted saying he is 'shocked' at the recycling centre incident in Birmingham. PM: Shocked to hear about the tragedy in Birmingham. My thoughts are with the families of those involved. 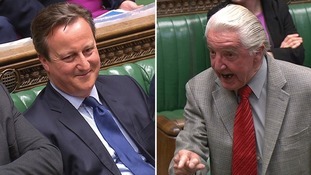 Dennis Skinner was booted out after refusing to withdraw the comment he made to the Prime Minister in a debate over the tax row. On a visit to Solihull to make an announcement on jobs as part of the Conservatives' election campaign, the Prime Minister David Cameron said he was looking forward to Aston Villa's FA Cup semi-final at Wembley tomorrow. Villa beat local rivals West Bromwich Albion to reach Wembley, and recorded an important win at Tottenham Hotspur last weekend to give their Premier League survival hopes a boost. Michael Gove has paid tribute to his successor as Education Secretary, describing Nicky Morgan as "one of the most intelligent" people he has worked with in government. The Education Secretary also told ITV News Political Editor Tom Bradby his new job as Chief Whip meant he could play a role in ensuring a future Conservative government would be "a genuinely reforming government and also a genuinely socially progressive government". On the bus travelling into Westminster with me exactly 24 hours ago was Loughborough MP Nicky Morgan. She was well aware that she was being tipped for promotion in the Cabinet reshuffle but insisted she had not received any telephone call from the Prime Minister. What a difference a day makes! She now enters the Cabinet as the newly appointed Education Secretary. A big move for the East Midlands MP who had impressed colleagues with her performances at the despatch box as a junior Treasury minister. Earlier this year she was also made Minister for Women - post she will retain as she takes up her new role.